Whispering Creek is the perfect getaway to the Smokies! 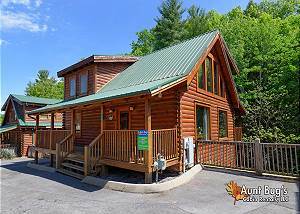 This Pigeon Forge luxury cabin is convenient to town with all the toys, including pool... VIEW NOW. We know that most families visiting the Great Smoky Mountains plan to spend most of their trip exploring the great outdoors. While we hope that you experience delightful weather throughout your vacation, sometimes Mother Nature can have alternate plans. The awesome news is that if you do happen to experience rain or other inclement weather, your family can head to your cabin’s game room for hours of entertainment! Before you know it, the weather will have improved and the sun will once again be shining for your planned outdoor activities. While parents love to spend plenty of time relaxing in the cabin, soaking in the hot tub and kicking back by the fireplace, it can sometimes be difficult to keep the kids entertained. When you stay in one of our Gatlinburg cabins with game rooms, you never have to worry about hearing, “I’m bored” from your children! The game room provides the unique opportunity for your kids to try a game that they may have never played before. They might just discover that they are a natural foosball or air hockey champion! While you are sure to have a wonderful time visiting the sights and attractions of Gatlinburg, some of your favorite memories are likely to be created in your cabin with a game room! Whether you are teaching your children how to play pool or your kids are teaching you how to play the latest video games, the game room provides a precious bonding time among families. After spending a vacation with Acorn Cabin Rentals, your kids will be wondering when they can come back again! Our Gatlinburg cabins with game rooms are situated in scenic locations among the Smoky Mountains but are still just a convenient short drive from downtown Gatlinburg! Your kids will love exploring the downtown area that has all types of exciting attractions including miniature golf courses, mountain coasters, haunted houses and just about everything else imaginable! After a day of walking around Gatlinburg, you can look forward to winding down in the game room before a night of rest in your comfortable bedrooms. The game room is just one highlight of our beautiful Gatlinburg cabins, which may also include other fun amenities such as a home theater room and your own private swimming pool! We have dozens of cabins available at Acorn Cabin Rentals and we would be delighted to help you find the perfect cabin for your family getaway to the Smokies! Check out all of our Gatlinburg cabins with game rooms to plan your family vacation to the Great Smoky Mountains! We hope to see you soon at Acorn Cabin Rentals!